There are 13 subspecies of Sika deer Cervus Nippon. One of these subspecies, race taiouanus, is endemic to Taiwan and is listed by the International Union for Conservation of Nature and Natural Resources (IUCN) as Critically Endangered. 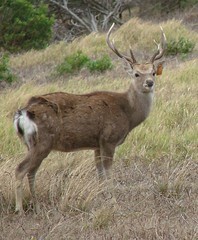 Sika deer are a medium-sized deer native to much of East Asia. 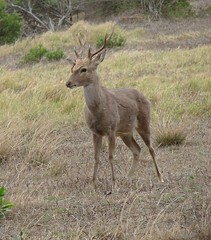 In Taiwan, the adult stag averages about 155cm in body length while the hind is a little smaller at around 147cm. 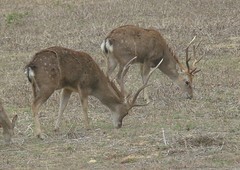 A stag's shoulder height averages around 98cm and a hind's around 81cm. The average body weight of a stag is around 68kg while the hind is a lighter 43kg (Wang.Y. & Chan.S.C, Formosan Sika Deer in Kenting National Park, 1998). 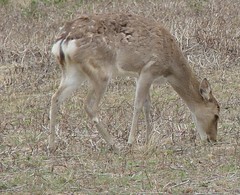 The Formosan Sika deer traditionally inhabited much of Taiwan's lowland plains and hilly areas under 300m. Being a lowland species it has faced ongoing destruction of its habitat from human expansion across the Western coastal plain starting in about 1624 with the onset of the Dutch colonial period. The species has also had to endure extreme hunting pressure. Much of Taiwan's economy was based on the deer hide trade during the Qing period and totals peaking at around a 100,000 hides were exported annually to countries like Japan through ports like Lukang in present day Changhua County, which translates as "Deer Harbour". The small population of wild Formosan Sika deer was pushed to the brink of extinction as what little remaining habitat was destroyed by post World War II development. In 1969, the Formosan Sika deer became extinct in the wild with the passing of the last known remaining deer in Taiwan's Eastern Coastal Mountain Range. Taiwan's first national park, Kenting National Park, was established in the early 80s in southern Taiwan. In 1984 the Kenting National Park Administration launched the Formosan Sika Deer Restoration Program using 22 domesticated deer from the Taipei Zoo. The deer were slowly conditioned for release into the Sheting area of Kenting National Park. In 1994, the first "wild" Sika deer were released into the park. This population has grown since its release and has been supplemented from time to time by further releases. Other areas in the species former range have been considered as other possible reintroduction areas but to date nothing has come of this. 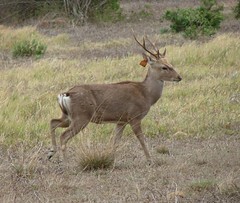 Researchers have proposed allowing the deer to be reintroduced into other areas on the Hengchun Peninsula in Kenting National Park. Areas such as low-lying parts of Yangmingshan National Park, the low hills of Kaohsiung County, and Long Valley in the Hualian-Taitung area have all been proposed. One can't help fearing that once again human activities are taking priority at the expense of this critically endangered species and preventing the Formosan Sika deer from being returned to even a fraction of its former range, and that for now and the foreseeable future, this noble creature will be confined to a small area of Kenting National Park as a mere token population of a once abundant species. Wang.Y. & Chan.S.C, Formosan Sika Deer in Kenting National Park, Kenting National Park Headquarters, 1998.